Viknesh Vijayenthiran September 29, 2016 Comment Now! The Volkswagen Group in order to shed any vestiges of its diesel emissions cheating scandal is embracing vehicle electrification with open arms. The automaker is committed to launching 30 electric cars by 2025 across its various brands, many of which will come from the namesake Volkswagen brand. VW already sells some electric cars, including the e-Golf here in the United States. Its next-generation zero-emission models, though, are being developed from the ground up to run on electricity. They will ride on a dedicated platform called the MEB, which was previewed in the Budd-e concept at January’s 2016 Consumer Electronics Show, and the first of these will arrive in 2020. VW on Thursday unveiled a concept previewing the first of its next-generation electric cars, a compact hatch about the size of the Golf. VW says the production version will be positioned as an electric alternative to the Golf and offer a maximum range of 373 miles. This figure is calculated on the European cycle and will likely be reduced when measured using EPA standards. Still, we’re expecting a range of well over 300 miles on a single charge. Charging can be done by plug or using an inductive charging system in the front of the car. With a high-speed charger, VW says the battery can be charged to 80 percent capacity after just 30 minutes. More advanced charging systems will eventually shorten this time to around 15 minutes. The MEB features the now familiar “skateboard” design popularized by Tesla [NSDQ:TSLA], where a flat battery is located in the vehicle floor and an electric motor or two featured at one or both axles. VW says the I.D. has a single electric motor mounted at the rear. (Yes, folks are already calling it a modern Beetle.) The motor is paired with a transmission integrated with the rear axle and is good for 168 horsepower. Subsequent production versions could also be offered with various power outputs and battery capacities thanks to the modular nature of the design. In addition to upcoming electric technology, the I.D. 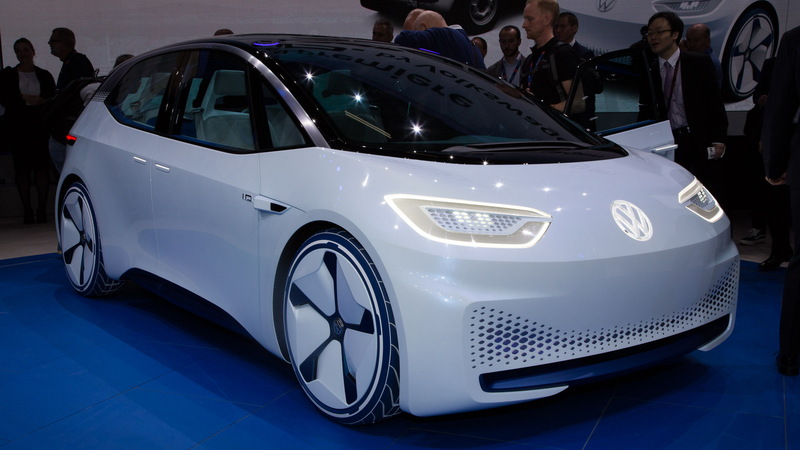 concept also provides a taste of self-driving systems VW is working on. VW says the I.D. is its first car equipped with a full autonomous mode, although the technology is far from ready for prime time. 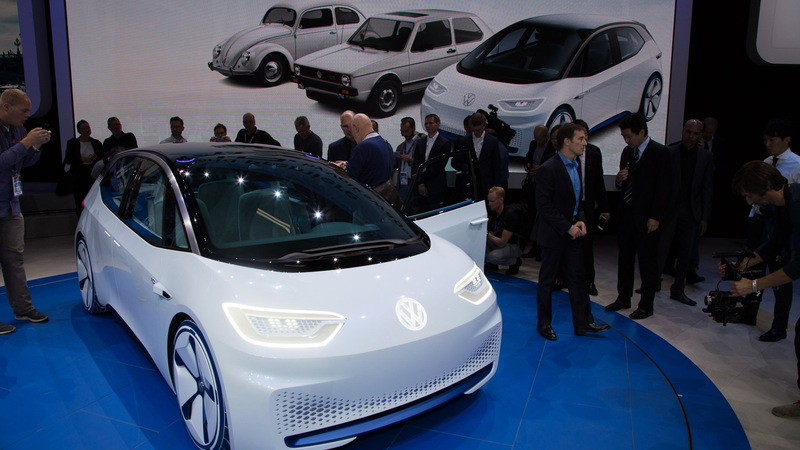 VW says it doesn’t expect to have a self-driving car in production until 2025 at the earliest. The self-driving system on the I.D. concept relies on a whole host of cameras and sensors including four roof-mounted laser scanners. (You’ll notice the four round elements on the roof.) These protrude slightly when the car is in self-driving mode and give off a soft blue light. Data is also gathered from ultrasonic sensors, radar sensors, and cameras. In addition, traffic data is also constantly collected and compared with the vehicle data via the cloud. The VW Group, through its Audi subsidiary, is helping build the cloud data via its stake in mapping company HERE. Also worth mentioning is the new infotainment technology featured in the I.D. The system relies on each driver having their own user profile that saves all their favorite settings and can be taken from car to car. Information is provided via a head-up display as well as a 10-inch screen VW calls the Active Info Display. This uses three transparent layers to display the various types of information. At the bottom, on the first layer there is the navigation map; various info based on the user profile is displayed on the second layer; and the third layer, at the top, is used to display driving data such as the car’s speed and range. 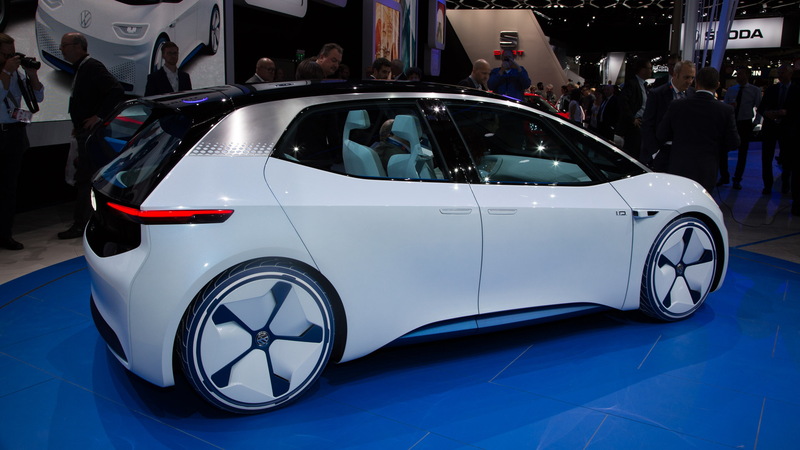 Note, VW is thought to be working on at least five next-generation electric cars, including a hatch based on the I.D. Another will be a minivan based on the earlier Budd-e concept. The others are expected to include a sedan, sports car and SUV. VW says the I.D. concept hints at the design language its new electric cars will feature.